Propane torches are very versatile tools that are used in the construction, manufacturing and agricultural industries, as well as for home use. In these areas, this product can be used in welding, removing paint, plastics, oil, and grease from non-flammable surfaces, melting snow and burning weeds among many other uses. However, there are different types of these torches in the market, all having different features that make them suitable for different needs. For this reason, our review below looks at the best propane torches that you can get in the market, with a view of helping you identify the one that suits your needs most. Small propane torches are not necessarily inferior to their large counterparts and this is proven by the TS8000 from Bernzomatic. Its arm is roughly 12 inches long, making it much easier to handle using one hand, even with the gas cylinder attached. This small size plus a cast aluminum construction makes the torch very lightweight, which is ideal for welding and soldering where precision is required because of its ease of handling. Additionally, it produces a large swirl flame that burns hotter for faster soldering time. The product is also one of the best propane torches for plumbing due to the same reason and a pressure regulator is included for consistent performance as you tilt or invert the tank. On the other hand, flame adjustability is done using a control knob for different applications. Other features include an automatic start/stop ignition, run-lock to keep the fire burning for continuous use and compatibility with MAP-Pro fuels. Red Dragon’s VT 2-23 C is an easy to use propane torch because it is shipped while fully assembled and ready to go. It also quickly hooks up to any refillable propane tank (a 20-pound cylinder is recommended) using a hand-tighten tank fitting so that you can begin using it as fast as possible. Once properly set up, the VT 2-23 C generates up to 100,000 BTUs of heat or in temperatures, up to 2000°F. 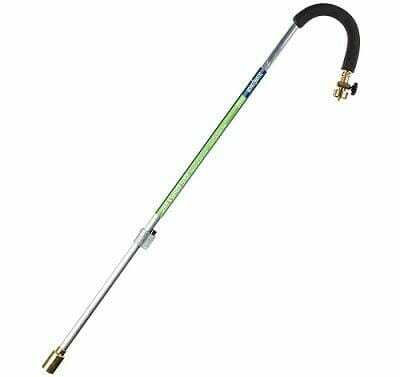 This heat makes the product suitable for burning up weeds in gardens, and it features a long 23-inch handle and 10-foot hose to help you reach and aim precisely at the weeds on the ground without bending. Other items included in the kit are a pressure regulator, an adjustable needle valve and a separate pilot spark lighter. If you want a heavy-duty propane torch that can flame weeds, remove paint, thaw ice on frozen pipes, burn off grease, oil, or plastic from metal and sterilize metal cages among many other things, Red Dragon’s VT 3-30 C should be the first product to consider. This is because the torch generates a very hot 500,000 BTU/hour flame that easily burns through whatever you point it at in a short time. To help direct this flame, the unit has a 3-inch diameter bell, which also helps to produce a thick and wide fire that is very hot. A 33.5-inch-long handle plus a 10-foot hose give you control by enabling you to move around while pointing precisely to the spot without bending or moving very close. On the downside, this product is quite expensive and it requires assembly before use. However, once set up, the VT 3-30 C is a very reliable and durable fire breather. Hot Max’s 500G is also a very hot propane torch that can deliver a 500,000 BTU/hour flame, making it suitable for home, farm, construction and industrial use in things such as paint removal, melting tar, thawing frozen pipes and the like. However, if you are on a tight budget, there are smaller BTU-rated torches available and these include the 50,000 and 100,000 rated units. Regardless of the size, using and handling this torch is simplified by the incorporation of an ergonomic molded handle, which makes it more comfortable to hold and control. Apart from this, the 500G is shipped while fully assembled and this makes it very easy and quick to use straight out of the box. Other features include a 10-foot UL/CSA listed gas hose that is rated at 350 PSI, a durable solid brass adjusting valve for flame control, a POL safety valve to prevent excess gas flow, a boost lever for increasing the size of the flame and a single flint striker for sparking the gas. Even though this VT 1-32 C produces a low heat 25,000 BTU flame, it is very affordable and has a convenient, lightweight and simple design that can be held by one hand, even with the gas cylinder attached. That said, the torch is designed to only use a 1-pound propane cylinder and this contributes a lot to its ease of handling because when fully set up, it is still very lightweight. Despite this, it has strong steel construction and a long arm, which ensures you do not bend as you burn weeds, light charcoal, and campfires, etc. However, an automatic start switch is not built-in and thus, the flame must be started using the included spark lighter. Other features include a non-slip grip and a flame adjusting needle valve. With a high price tag, you obviously expect premium features and this Hotspotter propane torch from Western Enterprises is equipped with just that. For starters, the unit has a built-in push-button igniter that gives it a fast and safe flame lighting process. It also has an ergonomically designed handle for comfortable holding and an adjustable trigger for flame control. The handle itself is quite long, measuring in at 31 inches, and this ensures that you have better reach. This is particularly useful because the Hotspotter is an all-purpose torch that can be used to burn weeds, remove oil, grease, paint, and plastic from metal, melting tar, etc. Even though assembly is required before use, these features combined make it the top-rated propane torch in this review. 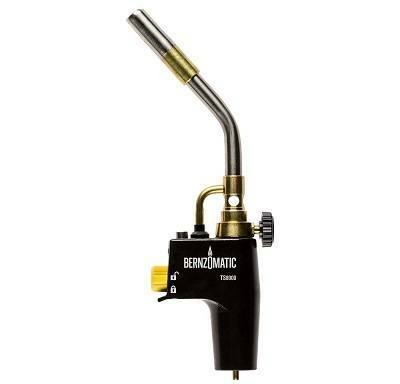 Bernzomatic’s JT850 propane torch stands out due to its simplistic design, which is basically in its long but plain 36-inch handle and a curved grip at the end that is hooked onto the flame control knob and gas cylinder connector. To add on to this, the product is designed to be used with a 1-pound gas cylinder, which further simplifies the whole piece once completely set up. The end result is also a lightweight torch that is much easier to handle. For adjustability, the flame control knob next to the handle enables you to mess around with the intensity of the flame while a built-in trigger-start mechanism gives the torch an automatic start by sparking the gas, making the process fast and safe. As much as propane torches may appear to be very similar and produce the same type of flame, not all of them are meant to serve the same purpose. The ones that have long handles give an extended reach, making them ideal for burning weeds, melting tar, removing paint from metallic surfaces or tarmac and the like. 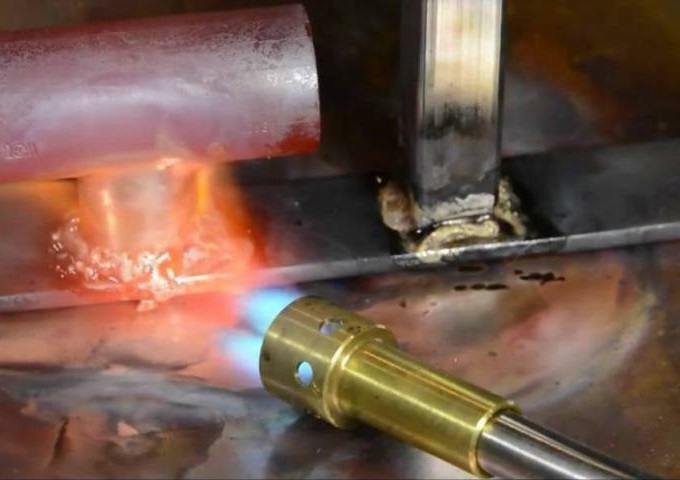 On the other hand, for welding, a shorter torch is best because it lets you use it at close range so as to weld or solder with high precision. Natural flame burners tend to have a moderate temperature flame but this does not mean that the flame is not hot. However, swirl flames are much hotter and most premium propane torches are designed to produce this type of flame. The high-temperature concentration over a small area makes this flame ideal for welding or soldering. Another thing to consider is the heat production of the flame. Measured in BTU (British Thermal Unit), the higher the value, the hotter the flame and vice versa. Flame adjustability is important because it gives you control over the intensity of the flame and is mostly done using a flame control knob. Apart from the intensity, this adjustability also lets you control how hot the flame is because the larger the flame, the hotter it is and vice versa. 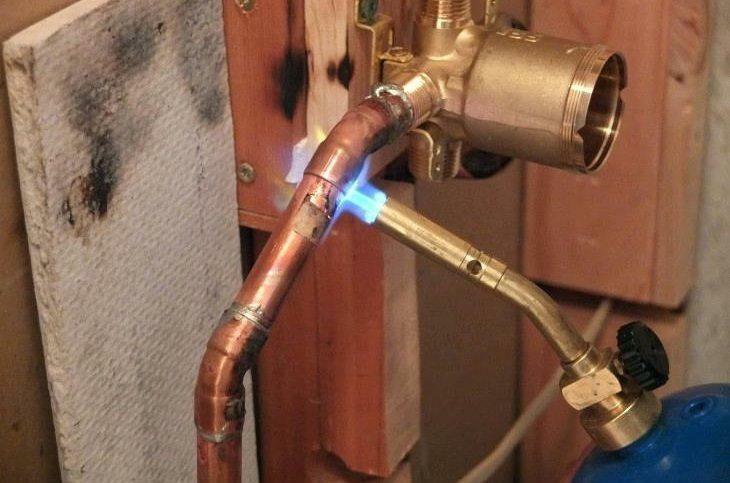 Therefore, if you intend to use your propane torch for multiple uses, this feature is key because it lets you control the flame size and temperature according to the type of project. Steel and aluminum are the most commonly used materials to build these propane torches and more specifically, the pipe and torch head or bell. Even though both materials are strong and durable, some models tend to have an aluminum structure so as to make them lighter. However, this also makes them more expensive and if you don’t mind spending some more for a lighter aluminum torch, go for it. Lighter is better. Ergonomics is a key factor when it comes to the handle design. Some torches don’t have well-defined handles, which makes it a bit uncomfortable to use them. Others have molded handles with grippy surfaces, making them much easier to handle. Determining the best here is a no brainer. Definitely, the one with the most ergonomic handle is better to buy. Ignition is often overlooked but it plays a crucial role in defining the ease of use of the torch. With an automatic ignition usually in the form of a push button, the process of firing up the gas to produce the flame is simplified and made safer as compared to the use of an external lighter. Therefore, even if the lighter is provided in the kit, buying a propane torch with a built-in ignition system is the best choice as it is also convenient. As you can see, there is more about propane torches than what meets the eye. The different designs, shapes, and flames that characterize these products make them unique and useful in a certain way. With this in mind, having gone through our review above, we hope that you will have an easier time picking the best propane torch that suits your needs and works for you.